LEESBURG, Va. — House Democrats gathered here for their annual retreat insist their caucus is unified and prepared to deliver on a slate of 2018 campaign promises that propelled them into the majority. But obstacles lie ahead as they seek to hold the House in 2020. The two major challenges Democrats face are crafting legislation that unifies the progressive and moderate wings, while also working with Republicans in the Senate and the White House to enact some policies into law. As reporters peppered lawmakers with questions on how to balance those seemingly conflicting goals, Democrats insisted they had it under control. “You guys have it all wrong,” Speaker Nancy Pelosi said Thursday, scolding reporters for writing about Democratic divisions following a public, intraparty disagreement over spending levels that preceded the retreat. Other leaders echoed Pelosi’s confidence about the caucus’s unity, but acknowledged there will be consequences if they fail to deliver. To illustrate that, Democrats touted the bills they passed during the first 100 days of their majority, which they celebrated Friday. Most of those, however, were easy wins — bills introduced with the vast majority of Democrats already on board. The obstacles ahead are on bills not yet written — like infrastructure and immigration overhauls — that will require major trade-offs. There are also measures Democrats promised to pass, such as a $15 minimum wage, that still lack enough support in the caucus. Members of the various factions stressed during the retreat that they want input on caucus proposals, while recognizing they face different political realities. Washington Rep. Pramila Jayapal, who co-chairs the Congressional Progressive Caucus, told reporters that her 90-plus members must be consulted on major policy initiatives. But she also understands many lawmakers outside her caucus are in competitive re-election races in GOP-leaning districts. Finding that balance is easier said than done, especially with vulnerable Democrats already facing Republican attacks tying them to liberal policies like the Green New Deal. “I often believe that the caucus under-appreciates the needs and pressures of our Frontliners,” said Connecticut Rep. Jim Himes, referring to lawmakers in the Democratic Congressional Campaign Committee program for vulnerable incumbents, most of whom are freshmen. Himes, a leader of the centrist New Democrat Coalition, pointed to a divide over raising the minimum wage and noted that lawmakers who have concerns about legislation that would bring the federal standard up to $15 per hour by 2024 are reflecting concerns from their districts. Alabama Rep. Terri Sewell, also a New Democrat leader, is spearheading legislation to institute a regional minimum wage, which would allow for areas with lower costs of living and purchasing power to more gradually increase their minimum wage. Education and Labor Chairman Robert C. Scott, who led a session at the retreat with panelists who argued for his $15 minimum wage bill and against the regional option, expressed confidence it can pass without changes. There are already 205 co-sponsors, and others have told him privately they’ll vote for the bill. Jayapal, also confident about the bill’s prospects, said Progressive Caucus leaders were working to sway members with concerns. The bill will eventually come to the floor and have the 218 votes needed to pass, House Majority Leader Steny H. Hoyer told reporters. Still, Sewell dismissed the notion that she and a dozen members who have co-sponsored her bill were being ignored as the majority of the caucus pushes for Scott’s measure. “We’re not afraid in the caucus to have different ideas and different approaches,” she said. Democrats are more optimistic about bridging internal divides than finding common ground with Republicans who control the Senate. “The only thing I would rule out is, we’re not doing another $900 billion stimulus,” McConnell said. The difficulty of avoiding a “stimulus,” or a federal investment that’s not offset, becomes greater the more Democrats want to spend. Pelosi said she wants the government to invest at least $1 trillion in infrastructure, preferably $2 trillion. Democrats are committed to finding ways to pay for an infrastructure package but have yet to coalesce around any one proposal. Members at the retreat mentioned at least four different ideas: Hoyer favors a gas tax increase; Democratic Policy and Communications Committee Chairman David Cicilline wants to roll back the GOP tax law for revenue; CPC Co-chair Mark Pocan floated a high speed financial transaction fee; and Kildee, a tax writer, suggested investment bonds. Most of the bills House Democrats have passed in the first 100 days have hit a brick wall in the Senate. And legislation they’re planning to move next month on climate change, health care and immigration are expected to face the same fate. Surprisingly, most Democrats don’t care. Several Democrats said it’s more important to show what their party stands for by passing bills out of the House and predicted that any failure to get top priority measures on infrastructure and lowering prescription drug prices signed into law won’t endanger their majority. “It’ll be a bigger problem for Republicans in the Senate,” said California Rep. Ted Lieu, a co-chair of the DPCC. Even if they can find common ground with Senate Republicans, Democrats face an additional question of whether to work with President Donald Trump. Anti-Trump sentiment energized the party last cycle, fueling high turnout that propelled Democrats to the House majority. But Democrats in competitive districts are still willing to work with a president they also regularly denounce. 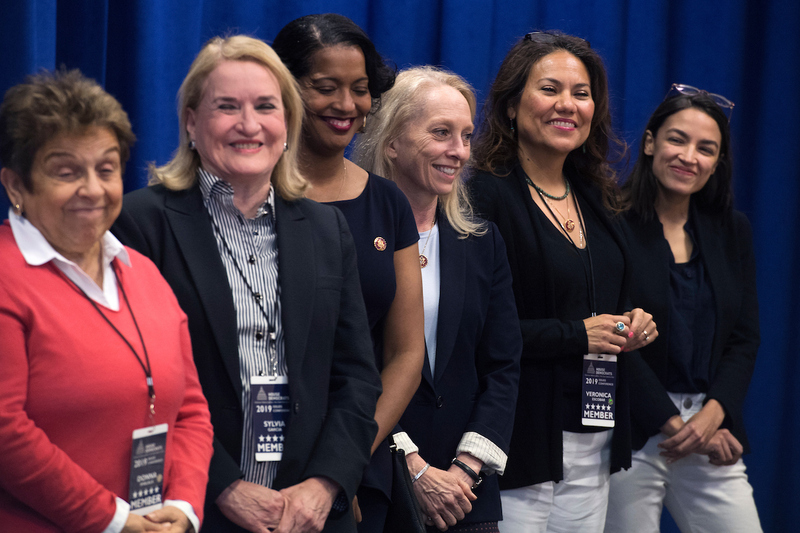 Connecticut Rep. Jahana Hayes and Nevada Rep. Susan Wild, both members of the DCCC’s Frontline program, and Florida Rep. Donna E. Shalala, responded with a chorus of “Yes, yes, yes” when asked if Democrats could work with the president.